Update: The speech is over, and it was remarkable and baffling. It was totally off the cuff and rambling. He blamed the revolution on foreigners and the media. He says if there’s a revolution, Libya will break into two, will be destitute, run out of oil, and the price of bread will skyrocket. He admitted that the protesters have obtained tanks. He says if there’s a revolution, the US and Europeans will prevent the emergence of any new Islamic emirate. Several times he said that Libya was not Egypt or Tunisia. This appears to be a regime at its end. 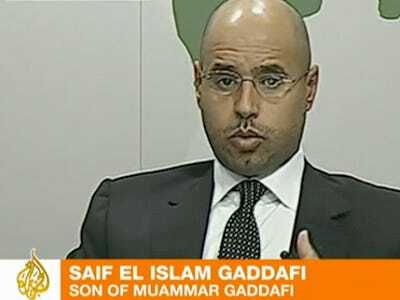 Original post: The son of Libyan leader Gaddaffi is speaking live right now. He’s blaming foreigners for fomenting the crisis, and the media for exaggerating the extent of the massacre, though he acknowledges that there have been deaths, thanks to errors made by the military. He says many protesters were on drugs. Also mercenaries and anarchists are to blame. Basically he’s totally rambling. It’s bizarre. Says young people are just trying to copy Tunisia and Egypt. Libya is different because we have oil! He just keeps saying over and over again that Libya is not Tunisia or Egypt. Even the unemployed thugs have tanks and guns. Warns that companies will leave Libya if there’s a revolution. Now he’s going on east/west divides. Libya will become like North and South Korea. Warns that post-revolution, America and Europe will never allow a new Islamic emirate. Muomar Gaddafi is no Mubarak! He’s received tens of thousands of messages of support.